He's a Spacer, but Tim Goddard (Rogue Bantha) is also pretty darned handy when it comes to building creatures. 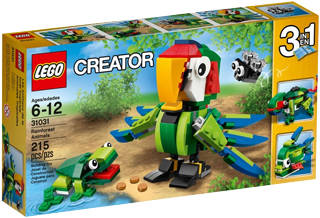 We sent him a copy of the delightful Creator 3-in-1 set 31031 Rainforest Animals . As always here at New E we do not pump out reviews, parrot fashion. We will not be overly dwelling on the much talked-about working bodily functions of the main model in the set. We will also not be recycling cheap jokes. On with the review.